A high deductible health plan (HDHP) is a type of health insurance with lower monthly premiums and a higher deductible. This plan can be a more affordable type of health insurance in terms of monthly premiums. But, as the name suggests, the deductibles are much higher than a traditional healthcare plan. But once you reach your annual deductible, you are 100% covered for the rest of the calendar year. Read on to determine if a HDHP is right for you. How Does a High Deductible Health Insurance Policy Work? Basically, a high deductible health plan offers a much lower monthly premium payment in exchange for a higher annual deductible. A minimum deductible for an HDHP is $1,350 for an individual and $2,700 for a family, so you can expect to have a deductible of at least that amount when enrolled in a HDHP. However, out of pocket expenses are limited at $6,650 for an individual and $13,300 for a family with a HDHP. To help offset the cost of a HDHP, you can open a health savings account (HSA). This type of account is only open to those enrolled in HDHPs and offers a tax-advantaged way to save for healthcare costs. While there are annual contribution limits, HSAs allow you to roll over your balance from year to year. You can also contribute to an HSA pre-tax, which is a big advantage. You should work to contribute the amount of your deductible each year to your HSA, so you will have money to cover your medical expenses. Although it may sound similar to a flexible spending account, they are different from each other. What Are the Advantages of a High Deductible Health Insurance Plan? The main advantage of the high deductible plan is that the monthly premiums are lower. If you are healthy, don't visit the doctor often, or don't have a large family, this may be the most economical type of health insurance plan for you. But keep in mind that a HDHP may be the only type of health insurance plan offered by your employer, so you may not have a choice. An HDHP may also be right for you if you have a lot of liquid savings. 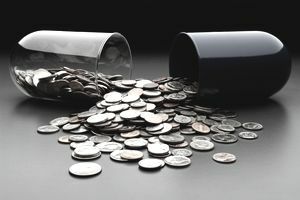 As mentioned, you should have enough cash on hand to cover both your deductible and potential out-of-pocket costs associated with this type of plan. Important to note: Avoid using a hybrid plan that has high deductibles and then copayments once you have met the annual deductible. What Are the Disadvantages of High Deductible Health Insurance Policy? The downside to a high deductible insurance plan is that you are responsible for paying everything out of pocket until you reach your deductible. You will pay 100% of the cost of prescriptions, doctor visits, and emergency room visits. You will also pay for the cost of surgeries and outpatient procedures until you've reached your deductible. It's important to remember that with a HDHP, your deductible is often higher than with a traditional health insurance plan. If you are considering having children in the near future, you should also check with your HDHP in regards to maternity coverage. You can also work on saving on your medical care by shopping for more affordable health care. When Should I Get a High Deductible Health Insurance Policy? You may consider a high deductible plan if you are relatively healthy and rarely go to the doctor. It is a good option if you need to cut expenses, but you should also keep in mind that you need to set aside a sizeable liquid savings to cover your deductible and out-of-pocket costs. You could do this using a tax-advantaged account like an HSA. Overall, a HDHP is a better option than going without health insurance. How Do I Choose Between a Traditional and High Deductible Policy? Your employer may offer a high deductible option or a traditional health insurance option. If they cover the entire cost of the premium, it may be easier to handle the budgeting with the traditional health insurance option. You should carefully weight the total out-of-pocket costs for both policies and then make your decision on the option that works best with your budget and spending style. If you are self-employed, you may choose a HDHP because the premiums will help you save money. Health insurance is one the things you should never cut from your budget. The risks are not worth the potential savings. You should cut all fun and luxury items from your budget completely before you stop carrying health insurance. In some cases, a HDHP will make it easier for you to maintain health insurance. Is Cellphone Insurance Worth It?